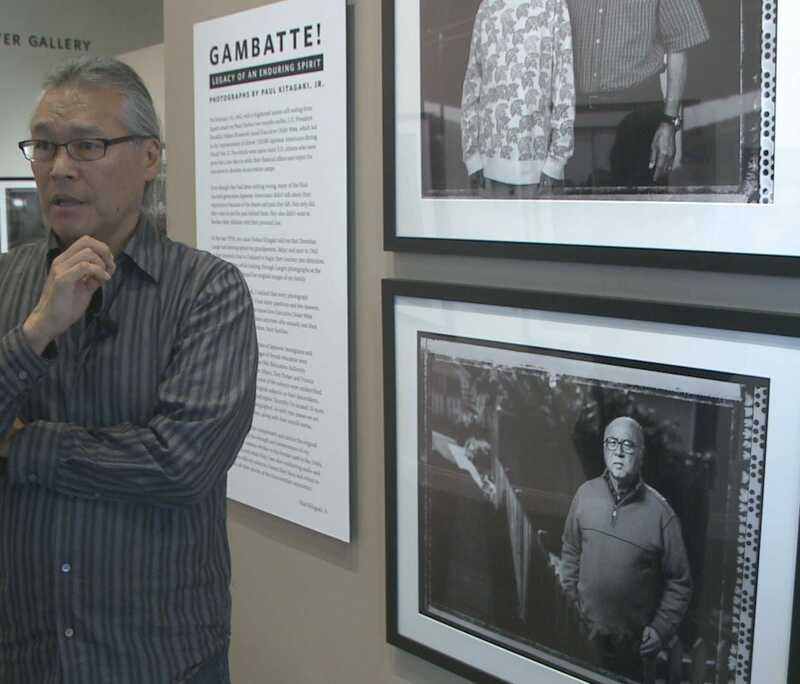 The “Gambatte!” exhibit at the California Museum in Sacramento remembers the 73rd anniversary of Executive Order 9066, which forced Japanese Americans, Italian Americans and German Americans into internment camps during World War II. The exhibit, curated and shot by Sacramento Bee photographer Paul Kitagaki, shows photos of Japanese American families in internment camps and where those families are today. A California Museum exhibit tells of Japanese-American internment in World War Two. SACRAMENTO - A new California Museum exhibit features iconic images showing hidden pain and terrible irony across 70 years. The images are part of "Gambatte! Legacy of an Enduring Spirit," an exhibit by Sacramento photographer Paul Kitagaki Jr. which opened Jan. 29. It features documentary photographer Dorothea Lange's shots of Japanese-American girls reciting the pledge of allegiance as they are about to journey to internment camps across the American West along with by Kitagaki's images of Lange's subjects today, found during ten years of exhaustive research. "I wanted to know what happened to everybody," Kitagaki said. That includes his own family, which was photographed by Lange. "The picture that Dorothea Lange shot was them waiting in these chairs at this location in Oakland for the bus that was going to take them to the Tanforan Assembly Center." The exhibition coincides with the Thursday anniversary of the date in 1942 when President Roosevelt signed Executive Order 9066 that led to the internment of thousands of Japanese Americans in camps across the West. Lange's images were his inspiration. "Those have always been haunting me... staring up at me and I wanted to know their story, how 9066 affected their family and what happened to them," Kitagaki said. Kitagaki's journey began when he discovered Lange's book of photos of the forced internment and later as he discovered four contact prints of her pictures of his own family among the National Archives in Washington, DC in 1984. In one of Kitagaki's photographs, Sacramento psychotherapist Dr. Satsuki Ina stands in a prison cell where her father was held at the Tule Lake Internment Camp for refusing to foreswear allegiance to Japan's emperor and agree to take up arms against America's enemies. Her father, a poet and U.S. citizen had considered taking his family back to Japan. "Just the sadness, the grief of what my parents had to endure. And the indignity," Ina said of her expression in Kitagaki's photograph. In another iconic image of Lange's, 7-year-old Mae Yanagi waits to be bused to the Tanforan Assembly Center in San Bruno, where she and her family lived in horse stables before being moved to the Topaz Internment Camp in Utah. "Don't dwell on it, just go on," Yanagi said of the way most internees felt after their release in 1945. She said the internment had a devastating impact on her older siblings and her father, who lost his business. He carried the effects of the internment for the rest of his life. "He was very angry about what had happened and always thought about it as being unfair," Yanagi said. Kitagaki's exhibition title, "Gambatte! Legacy of an Enduring Spirit," refers to the approach most Japanese-Americans took in the years during and after their internment. "You push through, and you don't complain, and you just kind of make a better life," Kitagaki said. The exhibit asks again why thousands of Japanese-Americans were forced to give up their lives and property to live in camps for up to three years when more than two-thirds were U.S. citizens and represented little or no apparent threat to American security. "How does that happen? How can that happen? You know, we're in the United States," Kitagaki said. The exhibit continues at the California Museum until May 3.